Well August came and went in a flash didn’t it? Here are some of the things I have been loving in August! These kept catching my eye in Sainsburys in the checkout queue of “must have some self-control” (I don’t…) I finally caved and bought one. I was very glad I did! Nutty, chocolatey, coco-nutty, and scrumptious. Damn those little ads on the side of Facebook… They know I am weak. But also not damn them because they bought this jumper into my life and I love it. This smells like maple syrup and I want to eat it. It is so freaking good there are not enough words. Rub it all over, smell like a pancake. This is what winning at life smells like…. and breakfast. Skimmed milk, less calories, still chocolatey. So happy. 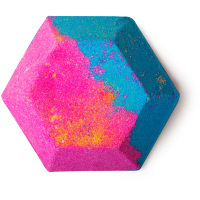 I have been dying to get my grubby paws on this bath bomb since seeing it in a vlog. I finally did and it is the most beautiful, fizzy, sparkly joyous thing to grace my bath since… well… ever. I posted about it in #findthehappy . Just beautiful! This. Just this. Explains itself. 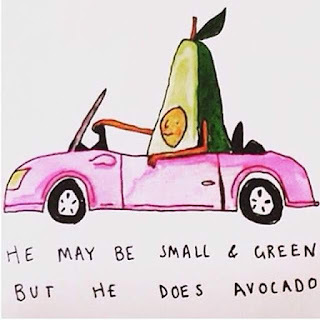 I probably laughed too much. 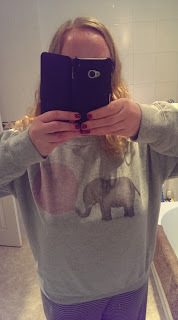 Your elephant jumper is tres cute! Do they do other designs with different animals? I love your elephant jumper, so cute. They have loads of cool designs but not with other animals. They have a couple of different elephant ones! I escaped with only one, I could have bought lots! You look so cool in your selfie sith the glittery band!